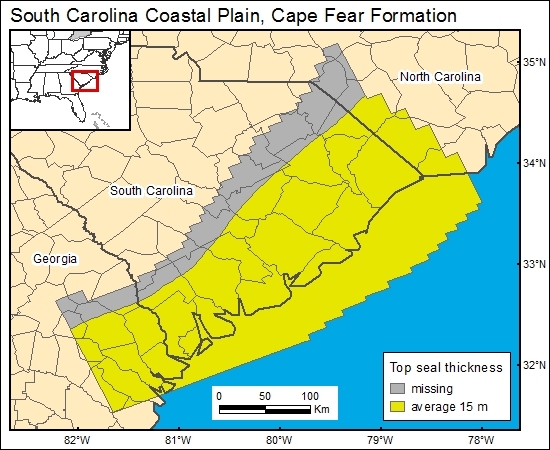 Several studies characterize the confining unit above the Cape Fear Formation as a tight marine shale (Aucott and others, 1987; Aucott, 1988; Miller, 1990), and the shale interval is apparent in published cross-sections (Colquhoun and others, 1983; Aucott and others, 1987). However, there is no published map showing thickness of the Cape Fear confining unit. On the basis of evaluation of logs in published cross sections, we determined that the thickness of the confining unit is consistent across southeastern South Carolina and averages about 50 ft.